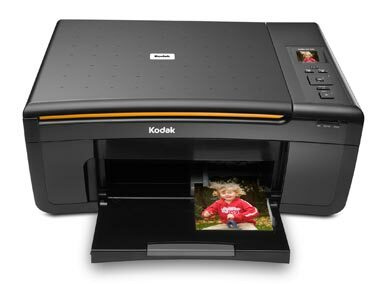 Aside from the fact that Kodak’s ESP 3250 color inkjet multifunction printer is inexpensive and doubles as a decent photo printer, it is an average-quality, rather slow machine, appropriate for light-duty school or home use. The ESP 3250’s configuration is modest. The 1.5-inch LCD screen on the top panel is small but legible. Its menus and control buttons are intuitive, as is Kodak’s Home Center printing/copying/scanning software. With many printers popping up with intricate touchscreen control panels and a superfluous amount of printing options, Kodak’s simplicity is a bit refreshing. The ESP 3250 is decently constructed. A roller insert in the back of the machine eases the clearing of paper jams. Ink-cartridge manipulation is a breeze, and the prop arm Kodak included, which keeps the scanner up and steady while replacing ink, made using it a lot easier. And since the scanner lid hinges have only one pivot point, it cannot rise to accommodate books or other thicker items. The single, 100-sheet front input tray also catches printed output, up to 50 sheets; this design, common among low-cost printers, is tolerable but messy. Furthermore, when printing out multiple pages, the ESP 3250 had a tendency to catch multiple layers of paper during printing. This eventually turned into a nuisance when it would grab more than one sheet unevenly, partially printing a document or an image at the top of one page, and finishing it at the bottom of another. Duplexing is manual on the PC, with help from the driver and the front-panel display-but on the Mac, you get zero help aside from Kodak’s support site, where an awkward workaround is documented in detail. During our performance tests, the ESP 3250 performed slowly for the most part, outputting just 4.4 pages per minute printing text, and 2.5 ppm printing graphics. Printing out a one-page text document took about 35 seconds, and printing a ten-page document took about two minutes and 58 seconds on average. A four-page PDF file, which included text and colored images, took about a minute and a half to finish printing. Samples we printed on plain paper were adequate: text came out charcoal rather than black, and images sometimes seemed grainy. Once we switched to Kodak’s own Ultra photo paper, however, the same images were on par with or better than the output of other printers we’ve tested. Of course, this all depended on the test and image. When we chose high-resolution sample pictures taken from top-notch cameras, the images printed out beautifully. But like most people who print out personal pictures from the Web, (like Facebook for example) pictures looked particularly grainy or blurry with dull colors. Scan and copy performance were good overall, as well. But setting the scan area when the borders were close to the unit’s maximum 11.5-by-8.5-inch area was a bit tricky and required a lot of zooming and scrolling. The single media slot takes Multimedia Card, Memory Stick, and SD Card. The ESP 3250’s ink costs are among the lowest in the industry. Included in the box are standard-size supplies: a 442-page black cartridge that costs $10 to replace (2.3 cents per page) and a 219-page, unified, five-color cartridge that costs $15 to replace (6.8 cents per page). In the color cartridge are cyan, magenta, yellow, and photo-black inks, as well as a clear protective coating. A page with all four colors costs a mere 9.1 cents. Unfortunately, the need to buy special paper to get the best results offsets those low ink costs somewhat. Kodak’s ESP 3250 could work for anyone who averages perhaps 10 to 25 text pages a day and want photo quality over other printing tasks. Other printers do a better job on a wider variety of media, but its ink costs can’t be beat.